This is the first book to provide a detailed overview and analysis of autodidactism, or self-education. Autodidacts' strong preference for teaching themselves is likely to manifest itself, in childhood, as a pronounced resistance to formal schooling. However, in later life, an autodidact's passion for learning will emerge as they participate in open or distance learning or even take responsibility for devising, structuring and following their own programme of education. 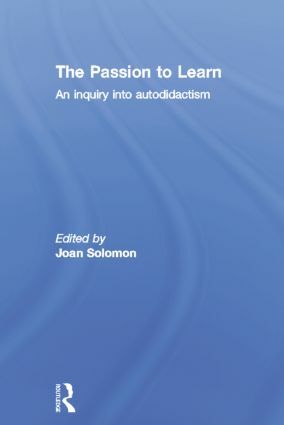 Beginning and ending with comprehensive and stimulating discussions of learning theories, The Passion to Learn includes fourteen case studies of autodidactism in informal learning situations, all written by authors with specialised knowledge. These wide-ranging case studies reflect the inherent diversity of autodidactism, yet four common themes emerge: emotional/cognitive balance; learning environment; life mission; and ownership of learning. The final chapter addresses the implications of autodidactism for educational theory, research, philosophy and psychology. This inquiry into autodidactism provides fresh insight into the motivation to learn. It shows how closely cognition, emotion and sensory perception act together in learning processes and draws upon memory studies, neurobiology, complexity theory and philosophy to illuminate the findings. At a time when such issues as participation in education, lifelong learning and alternative, non-formal modes of teaching and learning are in the forefront of international educational discourse, this fascinating, inspiring and timely book will be of great interest to anyone involved in the practice or policy of teaching and learning. Joan Solomon is Senior Research Fellow and Visting Professor at the Open University, Kings College London and the University of Plymouth.